My mind is still reeling from this month’s cover story. In it, we detail how a CIA agent, armed with the most advanced spying equipment, crawled through the catacombs beneath the Kremlin to place a listening device that monitored Soviet activity during the Cold War. 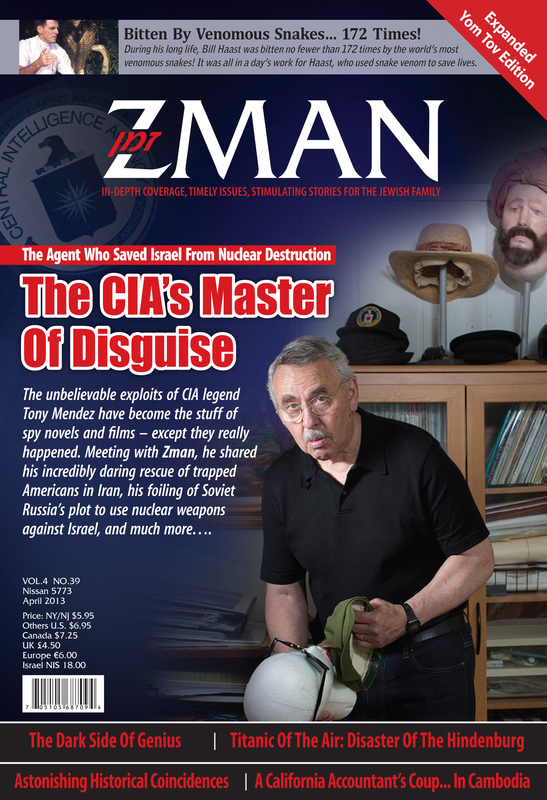 As this was happening, the subject of our cover story — Tony Mendez, the “master of disguise” — was overseeing an incredible body-double “exfiltration” at a gala Moscow event to help two Soviet spies escape to America under the noses of the KGB. And this is only one of his amazing stranger-than-fiction operations. Disguise — what a perfect theme heading into Pesach. Pesach reminds us that everything in our lives is ultimately manipulated behind the scenes by the true Master of Disguise. Our challenge is to realize it even today, even in current events that seem to run of their own accord. As of this writing, Israel is locked in heated negotiations over the makeup of the next government. At stake is nothing less than the identity of the Jewish state, epitomized by the issue of forced conscription of yeshivah students. In a recent shiur, Rabbi Yosef Viener emphasized how extremely dangerous this decree is and yet how difficult it is to explain to the average secular Israeli that the reason his country is still in existence is because the limud haTorah is generating tremendous zechusim. How does a Saddam Hussein fire 39 SCUD missiles into civilian areas and not one person is killed? How is it that war after war, incoming missiles cause relatively minor damage? How has a tiny nation been able to survive in a sea of hostile nations a thousand times its size? The answer is that there is a Hidden Hand involved. There is a Master of Disguise pulling the strings behind the scenes. How do we merit His help? Through Torah learning and its support. There is more Torah being learned now in Eretz Yisrael than at any time since the time of the Gemara. That zechus has enabled the miracle of Eretz Yisrael to continue. Between regional instability and Iran’s nuclear ambitions, we need more people learning Torah, not less. We need to realize that the trajectory of a missile and the presence or absence of people at its impact is a mysterious calculation not in human control. No matter what the outcome of the current political situation, the issue of forced conscription desperately needs our continual attention and tefillos – as well as our continual focus on the protection Torah provides for klal Yisrael. For years, the CIA needed to keep the work of their “master of disguise” hidden. But we need to do the opposite: to make the work of our Master of Disguise revealed. That is what Pesach is about. Kol hamarbeh l’saper, harei zeh meshubach. “The more one tells about the miracles in Egypt, the more one is to be praised.” May all Jews succeed this Pesach seeing through the Disguise and realizing Who is pulling the strings. This entry was posted in Rabbi Viener, Zman Magazine and tagged chareidi, draft, Israel.